So, a couple of weeks ago, I told you about making that killer budget. But putting a budget together is only a tip of the iceberg. Anyone can put numbers into an excel spreadsheet. Sticking to it is an entirely different ball game. It is where the strength and discipline really lies. So here are a few tips to help you execute the most glamorous day in your life but still have a life afterwards. 1. Cut Your Guest List: This is the first and most important tip I could ever give you especially if you are planning a wedding outside of Nigeria because most things are charged per head. The better you manage your guest count, the "more" wedding you'll have. An over-crowded wedding will not only cost you on every front (food, drinks, decor, linen, cake, etc), the bodies could potentially "overshadow" the day you worked so hard to put together. My guest list was one of the most challenging aspects of planning my wedding. You would be surprised at the amount of people you don't know who just want to come and eat rice at your wedding. What they don't know is that the difference between 5 and extra guests could be the difference between you drinking garri or indomie and jellof rice in your matrimonial home. I had be stern to that aunty who wanted to bring her cousin's cousin's wife and that long-time uncle who wanted to bring his random "lady friend". It wasn't a walk in the park and I'll be lying if I told you I didn't offend a few people. But in fact, it deserves an entire post on it's own. At the end of the day, G & I were spending our dime and anyone who was offended didn't love us enough to appreciate the value of our hard-earned dollars. If you didn't budget for an extra guest, say no. In your execution, just don't be rude. If your guest count drops later, lucky them. But until then, this is your money you are talking about. Limit the guest count to family and friends who are genuinely happy for you and who have contributed to your life in a special way. I leave the rest for the Guest List post. But you get the drift. 2. Stay out of Social Media: Once you decide on something, stop searching for it. I remember I had already bought my dress and been to 3 alteration appointments. The dress was almost ready to pick up but yet I found myself constantly browsing through Instagram hashtags and wedding blogs looking at dresses. It was all fun and window-shopping bliss till I saw one that made me question that one I already had but cost almost double more than mine. It haunted me till I pulled myself back into reality. And now the day has come and passed, I have no regrets. Once you decide on what you like, stick to it and stay away from Instagram, FB and pinterest. Dreamy temptations are not good for the wallet. 3. Be Open-minded & Communicative: A lot of brides come into wedding planning with a perfect picture of how the wedding is supposed to look. Perhaps the cake is the 10-tiered cake you saw on "Cake Boss" or the suspended number you screen-shot from Instagram. When you meet with vendors, give them your idea as inspiration and your budget but work with them to see what they can give you for your budget. Mayb you can still have the 10-tiered cake but with only 7 real cake tiers. No one would notice. Another option is to display a smaller designed cake and have a sheet version of the same cake in the back to serve to guests. Maybe you can still have open-bar but don't open it till dinner is served. Maybe your photographer can leave an hour before the end time. Maybe some of your flowers can be fake: When mixed in well, the real flowers shout enough to cover for their faux counterparts. These all sound like little things but the money you save will eventually add up. 4. Time And Sales ! Sales! Sales! If you are not in a hurry, give yourself a bit of a longer engagement to get time to shop for sales and vendors with good deals. Research! Research Research! Attend bridal shows and holiday sales. Like I discussed in the earlier post about creating your budget, once you prioritize, be ready to cut costs on other aspects. Consider buying or renting some things for the wedding, for example pre-owned flower girl baskets and ring bearer pillows. If you spend money on some of these things, they will sit idle for eternity. So, make etsy.com, ebay.com, tradesy.com and amazon.com your best friends and cut your costs where you can. Another option is even if you must buy these things, be ready to sell them online after you use them. You can recover some of the costs and in the end, "practically" have stayed under your budget. 5. Get Handsy: If there's something you know you can do well yourself or with your friends and family, don't pay someone else to. I'm not the do-it-yourself artsy kind of girl and like to pay professionals do what they are trained to do but there were a few things I had to do myself to save money. For example, we had an amazing stationary company but they charged about $600 to put together our invitations so I had them design and print it but then I invited my sisters and close friends and bought food, wine and ice-cream and made a party out of the invitation-assemby line. My sister Ogo actually did more than that when she was planning her wedding- she bought the supplies and designed and printed the stationary herself! What's more shocking was after my perfectly steamed dress got rumpled while carrying it on the plane from Mayland toTexas and I took it to get steamed and got a quote for $300 to get it re-steamed, I called my sister and whined they must be smoking crack. Instead of spending that "emergency" none, I called around and got a steamer and my loving aunty who was visiting from Nigeria was more than willing to steam the dress for me. I returned this favor for my cousin when she renewed her vows. I steamed her dress for her and saved her a good amount of money. *Be careful who you delegate to though-Always make sure it is someone you trust to accomplish the task and do it well. 7. Use Your Connections: Inquire about sales and discounts from your vendors. For e..g your photographer may know a videographer s/he can call for you and get a discount. One of the perks of having a wedding planner is that they often have discounted plans with vendors. So if you have one, use the contact and save some money. 8. Play Smart & Negotiate! : A good number of vendors will first ask you what your budget is. Then, proceed to quote you a bit more than that. So, when you are asked, give about 20% less than your budget really is. That way, you can play safe incase they quote you more. It gives you a better bargaining stance. 9. Don't Forget Ms. Miscellaneous: Remember her? The mischevious creepy surprise that creeps up in your wallet last minute that I talked in my post about creating the budget itself. I'm saying it again here because it will happen. So, make sure you budget for last minute mishaps. That way, you can accommodate surpass expenses without going over your budget. Simply put. 10. 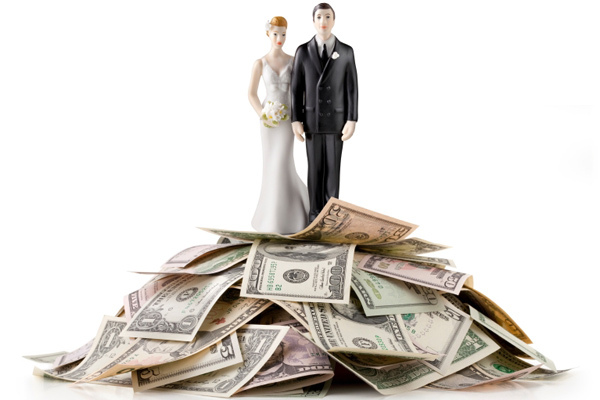 Budget for Taxes and Service/Labor fees: A lot of brides in the U.S. don't know this but when each vendor gives you a price, it doesn't include taxes, service, labor or delivery fee, if applicable. So, for each item on your budget, provide for at least an additional 10 to 25%. If you pre-plan for it, it won't tip you over. Ultimately, remember this is a one-day event. So, avoid spending money on frivolous things that even you won't remember exist that day. Like I said prioritize and be wise! - What budget??? lol... We've saved so much money by doing our entire wedding stationaries, buying vs renting table sets and linens that I think I deserve a little splurge here and there. I have been bad with this but oh-well! - I will also add compromise with yourself and remembering that this is real life and not a competition to be on some TV show. @ReadySet LOL @ Budget what? The best line in your comment is "remembering that this is real life and not a competition to be on some TV show". Gbam!!! You know where it's at. Best of luck! It'll all come together beautifully!